Northwestern’s Women in Computing chapter offers academic, networking, and career support for young women interested in tech. 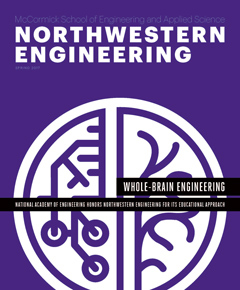 Alaina Kafkes came to Northwestern in fall 2013 intent on studying chemistry and with dreams of working in medicine or science. One year later, after taking Fundamentals of Computer Programming— and with a newly kindled interest in technology—she felt less certain about her future. Inspired by that one meeting, Kafkes applied for and was chosen to sit on WiC’s executive board. Soon thereafter, she changed her major. “WiC is definitely why I did it so quickly,” said Kafkes, now the group’s co-president. Any woman with an interest in technology—regardless of her major—can become a WiC member. As more women enroll in and complete their computer science studies in the McCormick School of Engineering and the Weinberg College of Arts and Sciences, WiC gains prominence. At last count, the group had about 135 members on its Listserv. “Due in part to organizations like WiC, we’ve seen a big change in the number of women interested in computer science in a short amount of time,” says Anne Marie Piper, assistant professor of computer science in McCormick, communication studies in the School of Communication, and in Northwestern’s Segal Design Institute. By all indications, the trend will continue. As of winter quarter 2017, women accounted for 126 of Northwestern’s 489 computer science majors. Many male computer science majors become interested in coding early in their lives through video games and arrive on campus with some programming experience. Conversely, faculty have observed that many female engineering majors take their first steps into computer science only after they get to college. Still, computer science classrooms at Northwestern—and most other engineering schools—remain dominated by men. “As a woman, I might think there are no other people like me in this class, so I must not belong,’” Piper says. Junior and senior WiC members often help first-year students and sophomores with homework. “If you’re stuck on a problem, you can get on a group chat for WiC and say, ‘SOS! Can anyone help me?’” says Aiqi Liu, a junior computer science major. 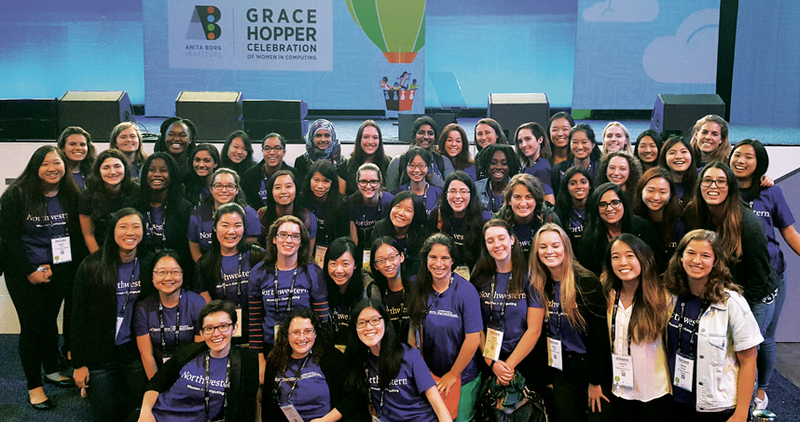 To encourage women to network beyond Northwestern, McCormick sent a 55-member delegation of students and faculty to the 2016 Grace Hopper Celebration of Women in Computing, the world’s largest annual gathering of women in technology. The delegation was supported by donations from Ben and Lisa Slivka and Bill and Jeanne Bliss. The three-day October event, produced by the Anita Borg Institute, drew 15,000 women from 87 countries. The event also included a major career fair that drew some of the world’s most prominent tech companies, including Google, Facebook, and Apple. More than half of Northwestern’s students had two or more interviews during the conference, while a quarter scheduled interviews afterwards. Two students received job offers on the spot. 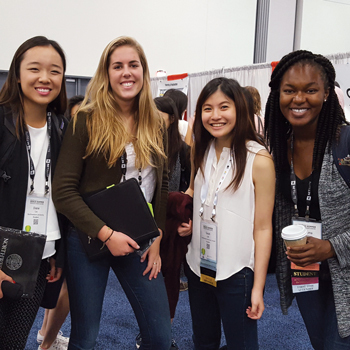 Back in Evanston, the Grace Hopper conference attendees shared their experiences with other WiC members. Liu, the group’s corporate outreach chair, invited industry experts to speak at WiC on the wide-ranging opportunities in tech. For winter quarter, Liu set up a roundtable where eight professionals representing a variety of roles at Google, IMC, and Motorola Mobility met speed-dating style with members. One of the weekly sessions was designated HackThisSite night, where students practiced hacking legally and safely. “We were actually investigating security vulnerabilities,” Liu says. “We don’t learn things like that in class.” Other weeks, the group learned how to make basic apps, and Grasse, who interned at Apple in summer 2016, taught a course on basic iOS. Grasse and Kafkes have also launched a local event called BuildHer. “It’s Chicago’s first student-run, all-female hackathon,” Grasse says. BuildHer brings women with various backgrounds and experience together for two purposes: to inspire those who want to get started in tech but don’t know where to begin and to help those already involved in the tech community to network with other female thought leaders. With the skills and connections they make on campus, many WiC members have secured prestigious internships and promising jobs. Grasse, for example, will return to Apple for a second summer internship. Liu, an intern at Motorola Mobility in 2016, will intern at Google this summer. Kafkes, a senior, will head to San Francisco after graduation to become a software engineer at Medium, an online publishing platform. WiC members say they plan to stay connected beyond graduation, continuing to network and to help each other and future Wildcat WiC members in their careers. “The goal is for everyone to succeed,” Kafkes says.